A brief word of explanation about the first part of that title, it’s a variation of the “Resist, we much” teleprompter reading gaffe by the Reverend Al Sharpton, where he meant to say “Resist, we must” on his TV show. It lends itself to a variety of other overblown political situations which beg for a “Sharptonism” parody. 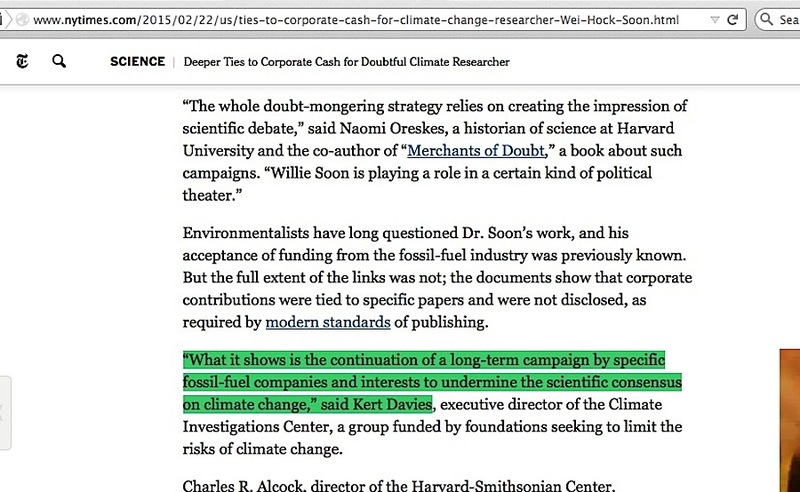 The latest instances where Boston Globe, New York Times, and Washington Post articles cited Kert Davies’ supposedly damaging documents (screencaptures here, here and here), in an effort to trash skeptic climate scientist Dr Willie Soon, invites exactly that kind of parody. 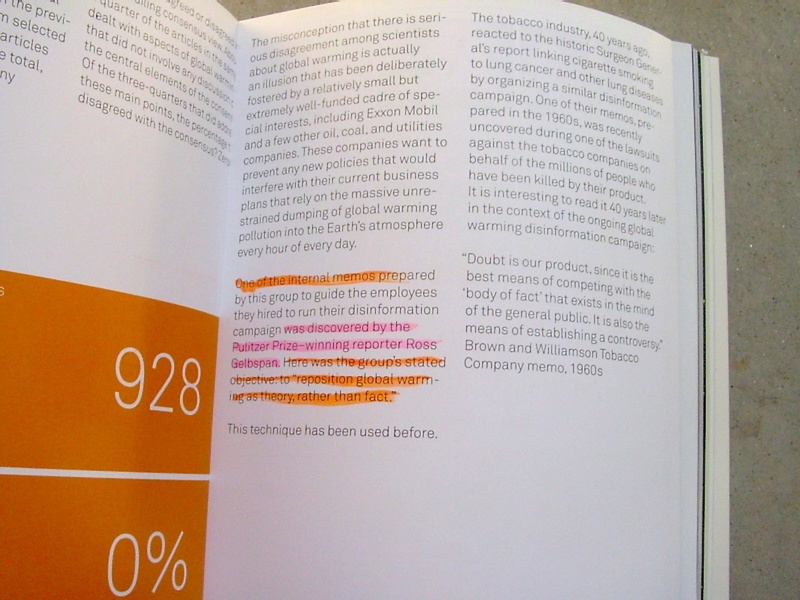 Funny how none of those publications bothers to mention (hiding appearances of bias, we much?) 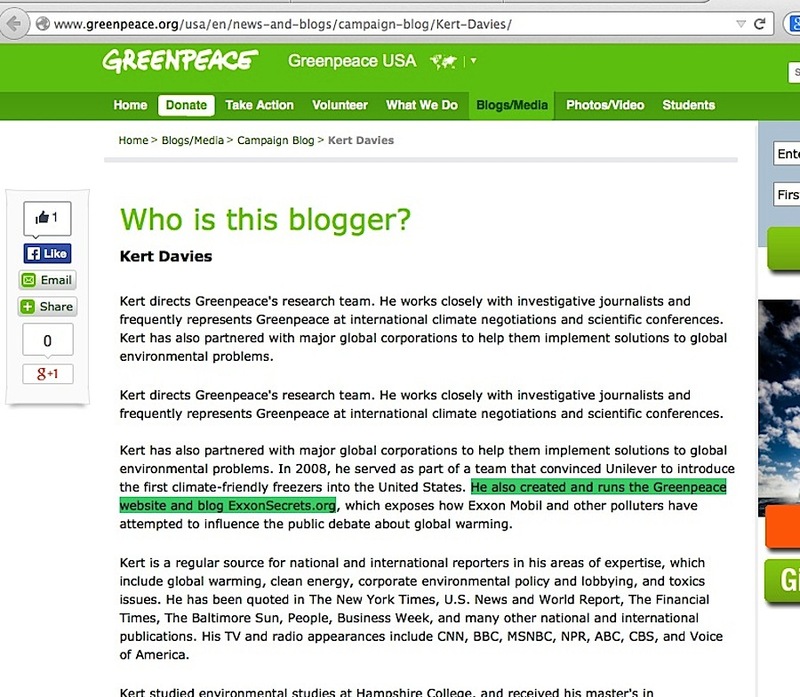 Davies’ former position as Greenpeace’s Research Director. 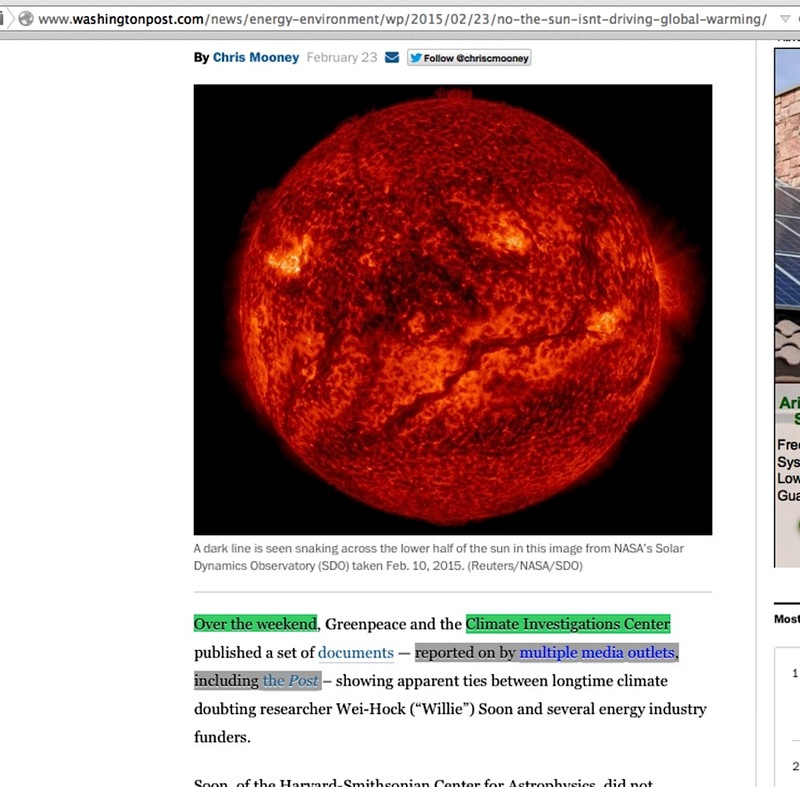 Regarding the Washington Post article in particular, the comical aspect of it is how the lateWashPo editor Ben Bradlee must be spinning in his grave at the sight of Chris Mooney as its author – Mooney being nothing like the thorough reporters who investigated the Watergate scandal under Bradlee’s command, but is instead apparently too much in love with Ross Gelbspan’s ‘industry-corrupt skeptic climate scientists’ accusation, as I described in my 2011 WUWT guest post. 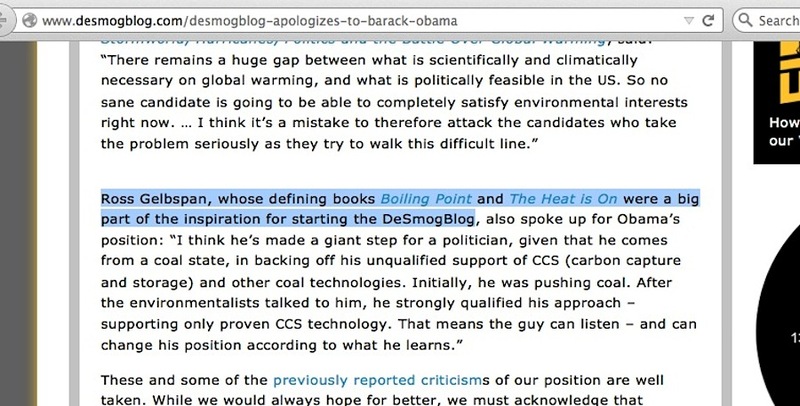 Conspicuous by its absence in Mooney’sWashPo bio is his association with Desmogblog, the anti-skeptic site built around the works of Ross Gelbspan. But, that’s only part of the silliness. 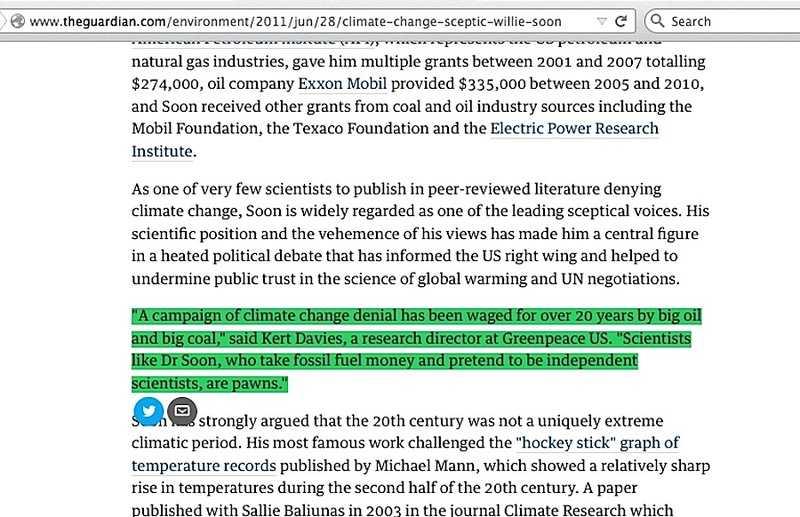 It isn’t simply that Kert Davies is also the source of this ‘breaking’ story for nine different science journals, it is the plain fact that there is nothing new in these reports that wasn’t already seen in older reports on Dr Soon which cited Davies just the same way. 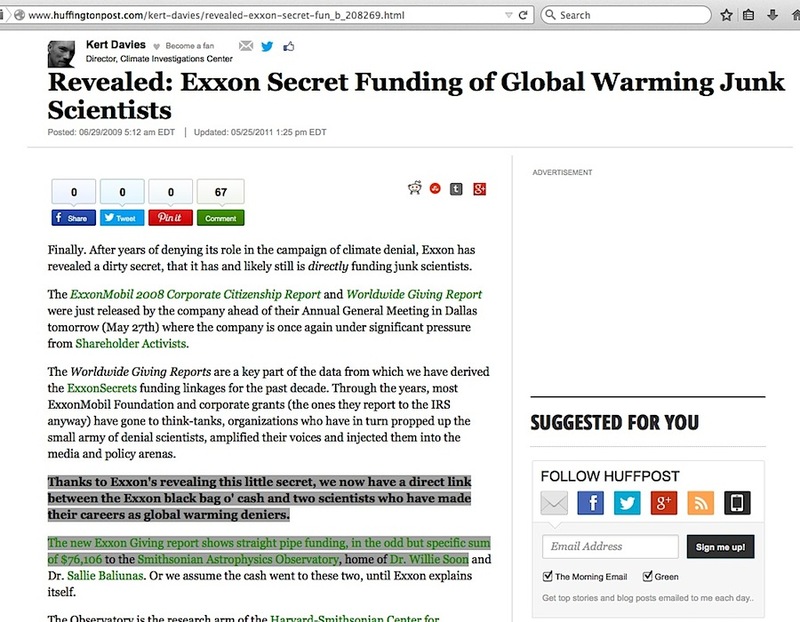 “A campaign of climate change denial has been waged for over twenty years by Big Oil and Big Coal,” said Kert Davies, a research director at Greenpeace US. 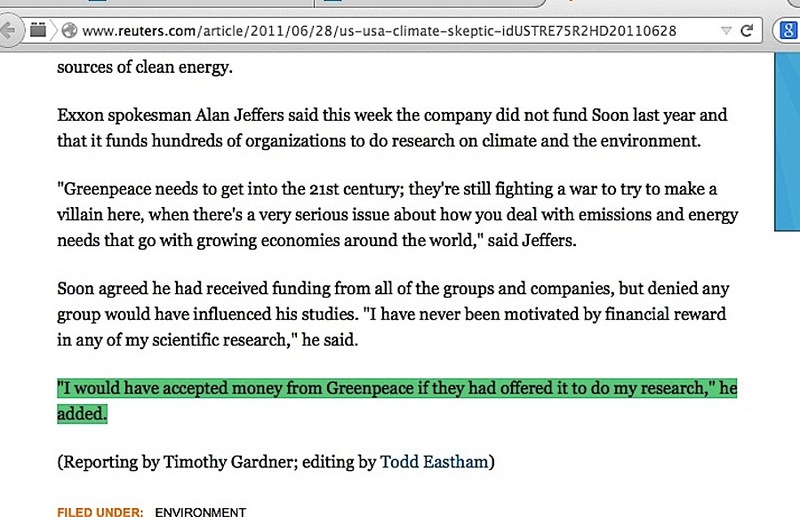 The UK Guardian’s same-day variation written by John Vidal contained the identical quote from Davies, but Vidal skipped the last sentence in the Reuters article where Dr Soon said he’d gladly accept Greenpeace funding. 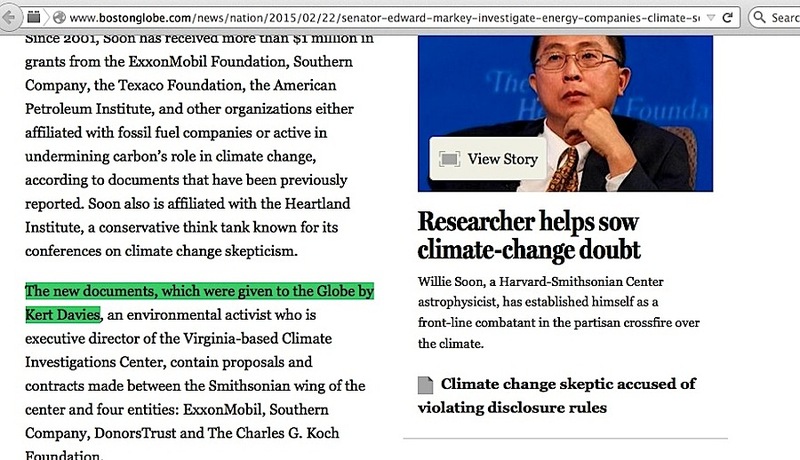 An internet search of just that date and Dr Soon’s name shows just how far and wide those twin stories were spread. 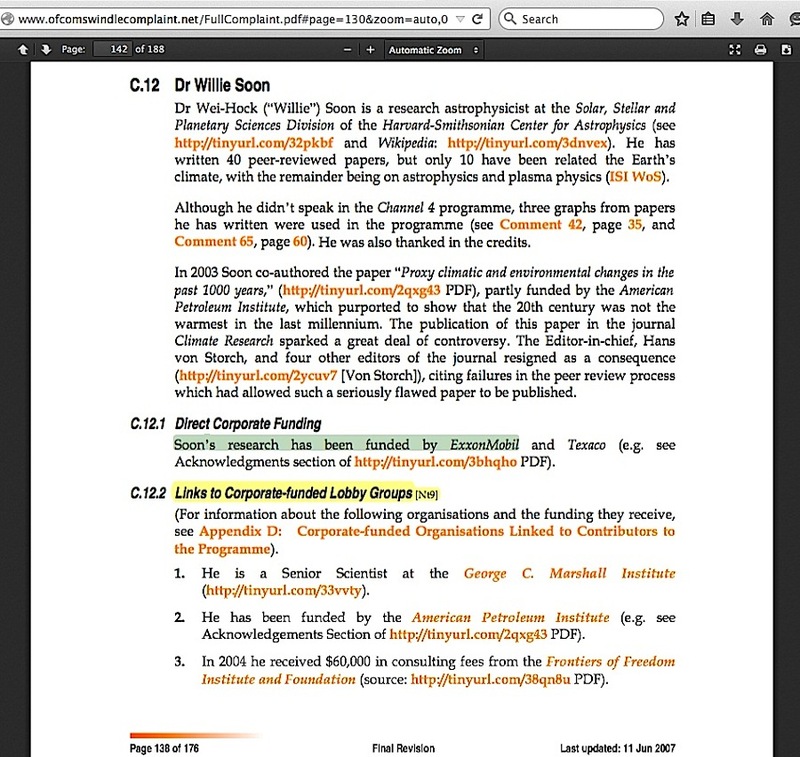 Want to see a fun circular citation in action? 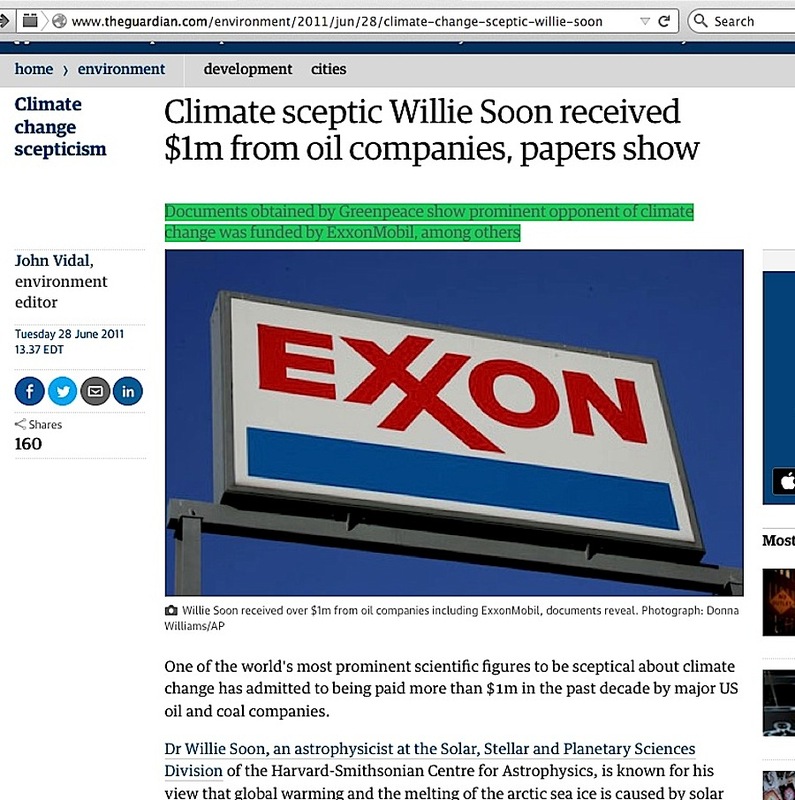 Greenpeace’s own ExxonSecrets web site (created and run by Davies) has a page dedicated to Dr Soon, where it cites the above John Vidal Guardian article as the source to say Dr Soon received a million dollars of ‘big oil’ funding. Who did Vidal cite for that? Greenpeace. 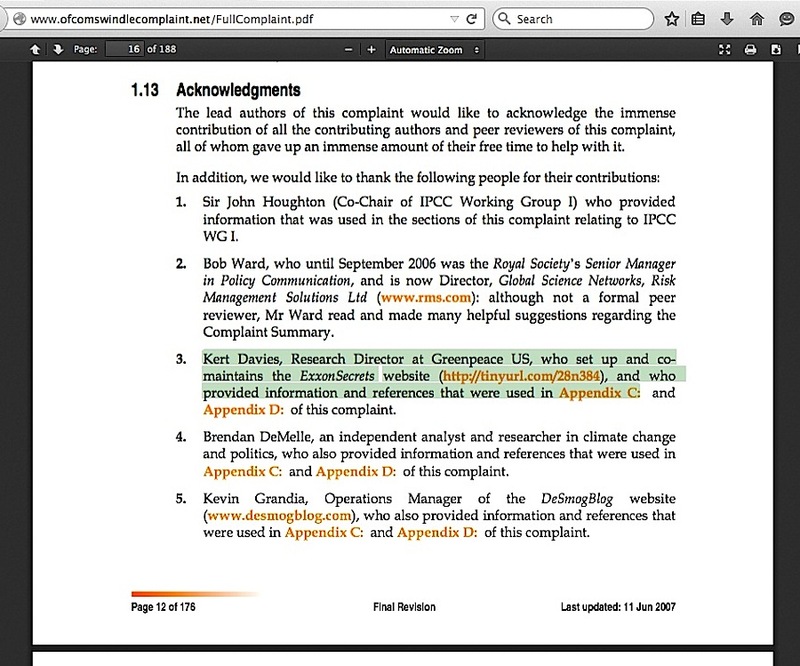 Back in 2007, a giant 176 page official complaint was lodged at Ofcom, (the UK’s communications regulator of broadcasts) about skeptic climate scientists seen in the British video “The Great Global Warming Swindle”, and the complaint went so far as to include its criticism of Dr Soon’s non-speaking contribution to the film, while noting his ‘big oil’ funding. 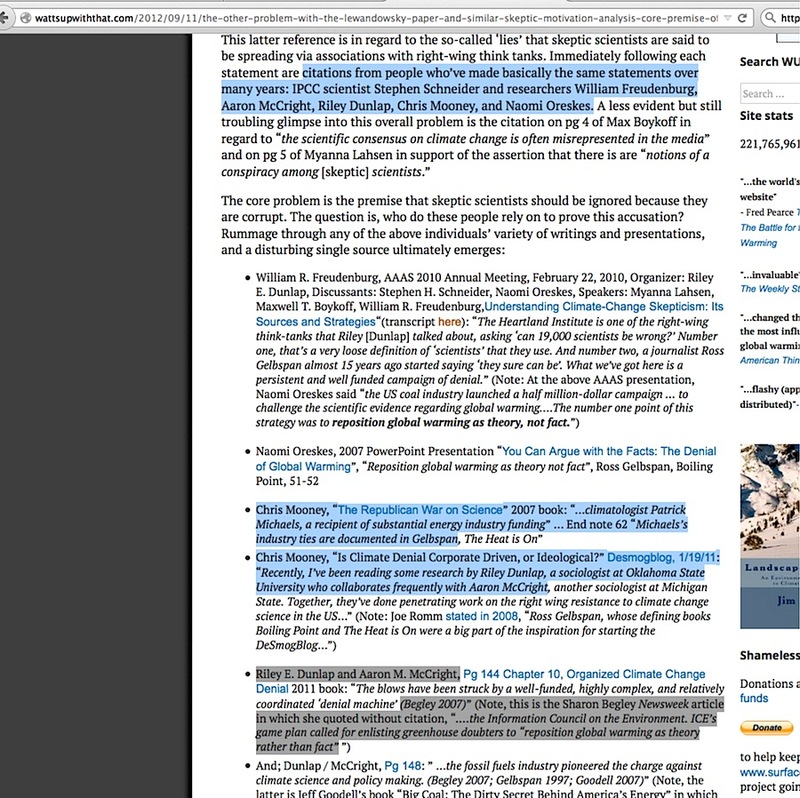 Who did the complaint cite for news of that? Kert Davies. Stop the presses! Breaking news! 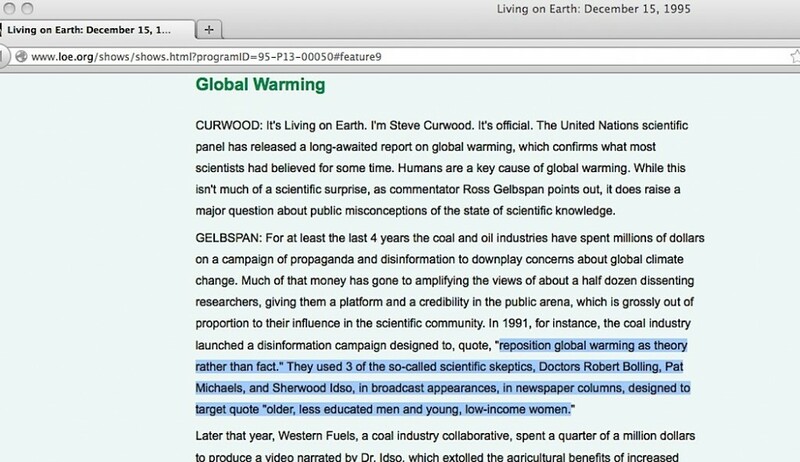 However, this GelbspanFiles blog focuses on the origins of the overall smear of skeptic climate scientists. 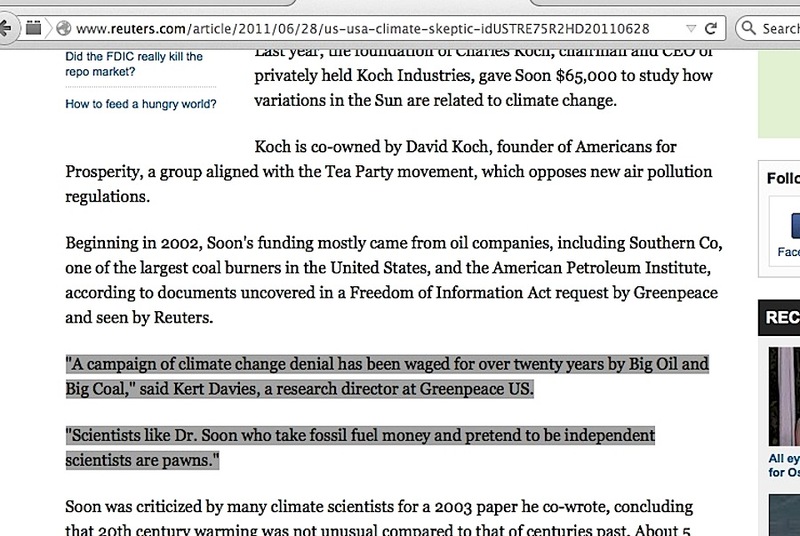 To see how Kert Davies fits into that, we have to go back about a decade earlier. 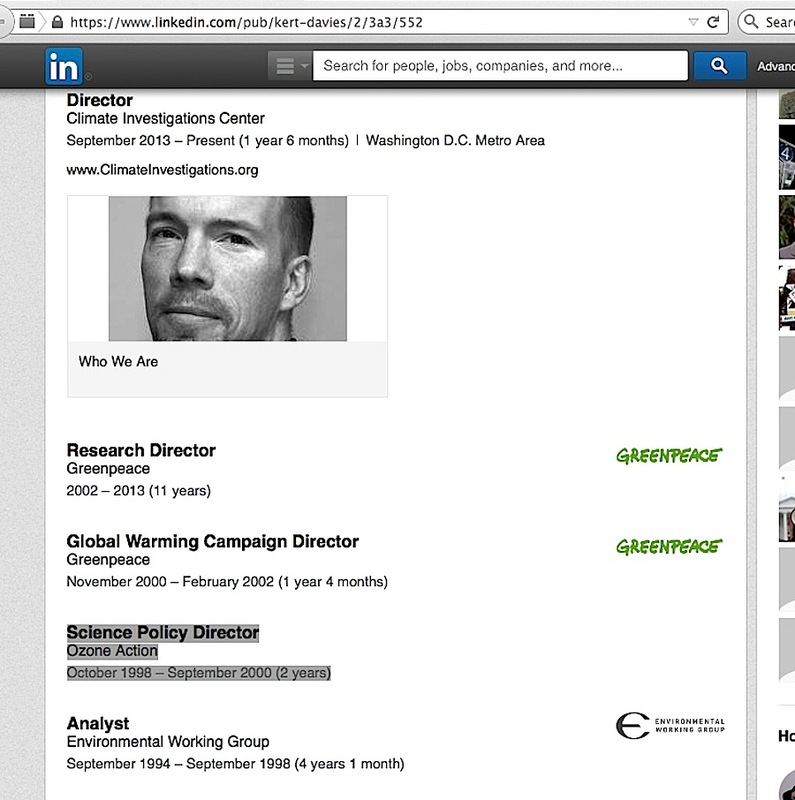 Prior to starting at Greenpeace in 2000, Davies worked at Ozone Action, the organization that merged into Greenpeace USA in 2000. 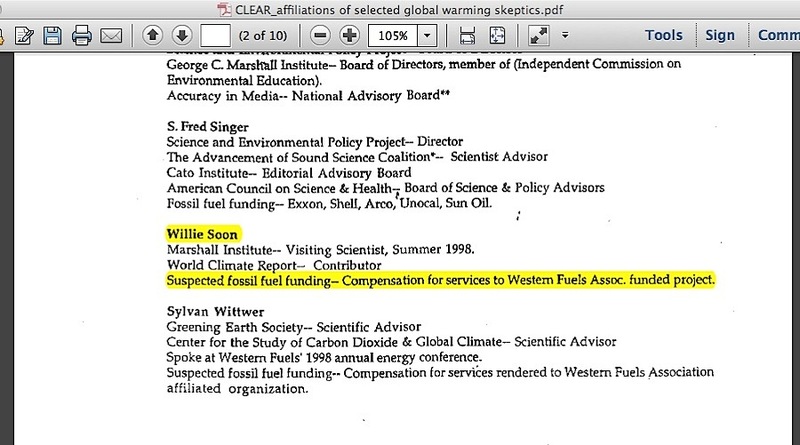 Prior to that, he worked at the Environmental Working Group, which produced an undated Clearinghouse on Environmental Advocacy and Research (CLEAR) report titled “Affiliations of Selected Global Warming Skeptics” (“Greenpeace USA née Ozone Action”’s copy here), which says the following near the end of page 2…. 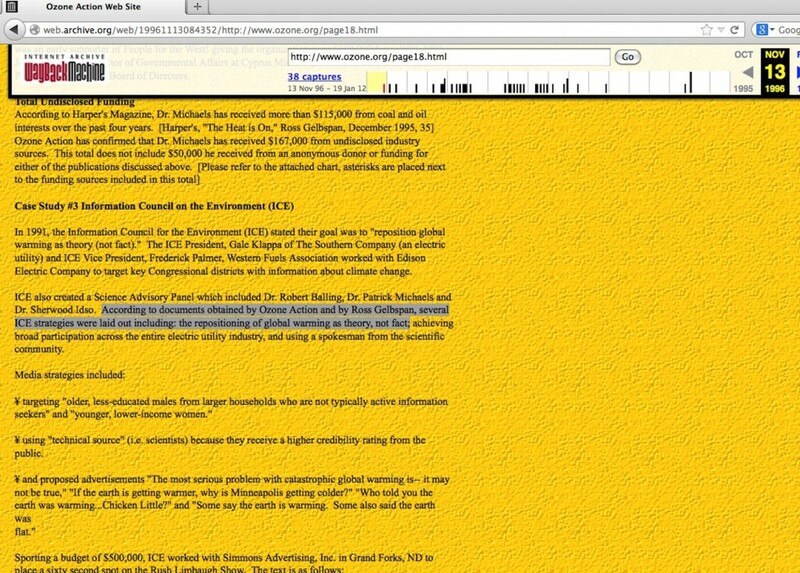 Organizational affiliations are from CLEARS database, compiled from primary sources and media reports. 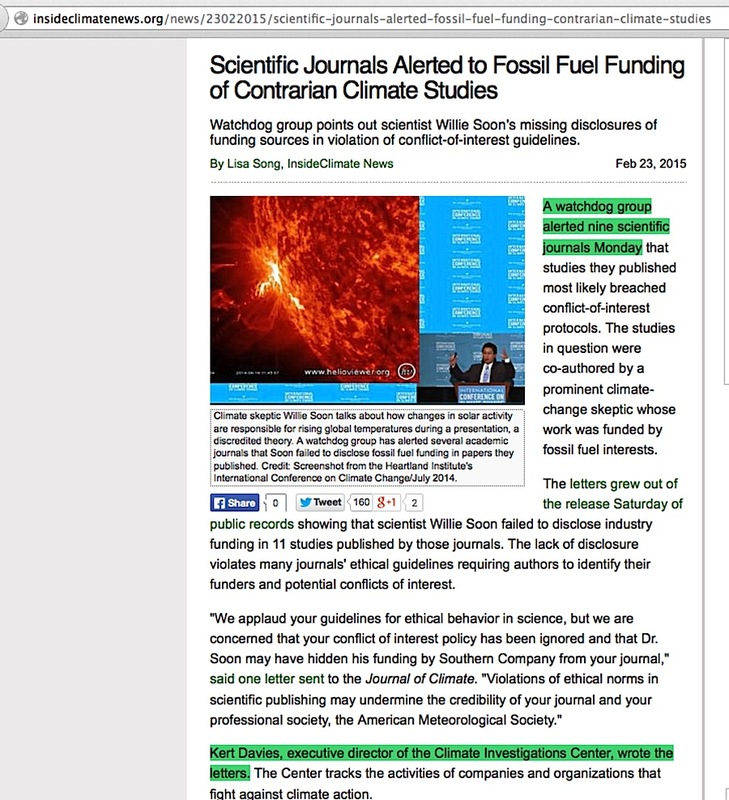 Additional research assistance provided by Ozone Action. Ross Gelbspan, “The Heat is On,” Harpers. December 1995. 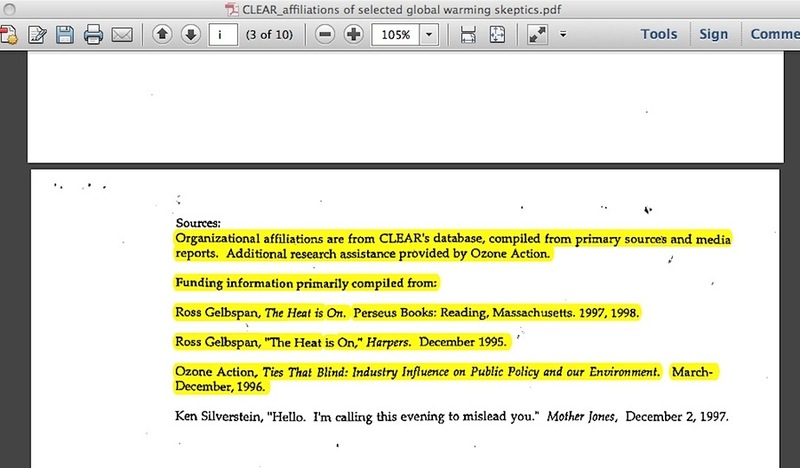 My educated guess is that Gelbspan and Ozone Action ‘obtained’ those documents (assuming their statement is accurate) sometime around late 1995, since Gelbspan first mentioned them in a December 1995 radio interview. Who did they ‘obtain’ the documents from? 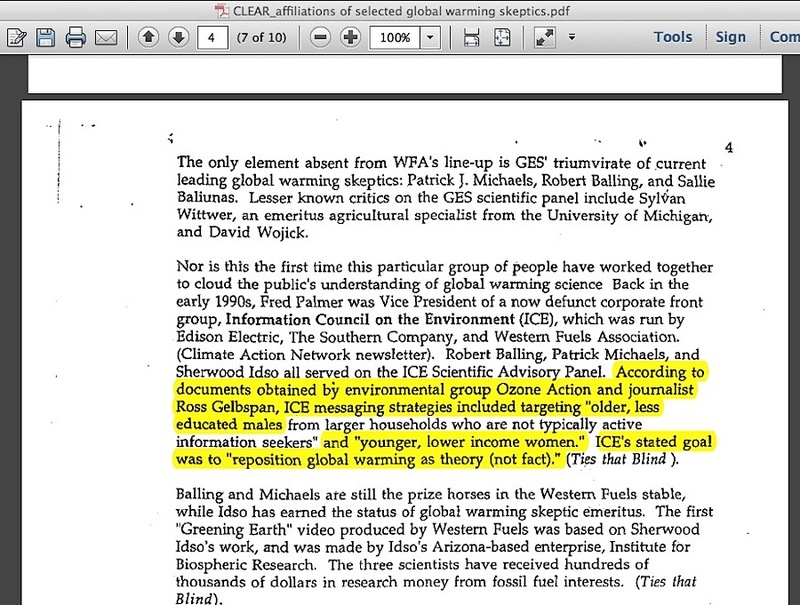 Well, the above CLEAR report mentions the same “older, less educated males”/ “younger, lower income women” seen in Al Gore’s 1992 book. 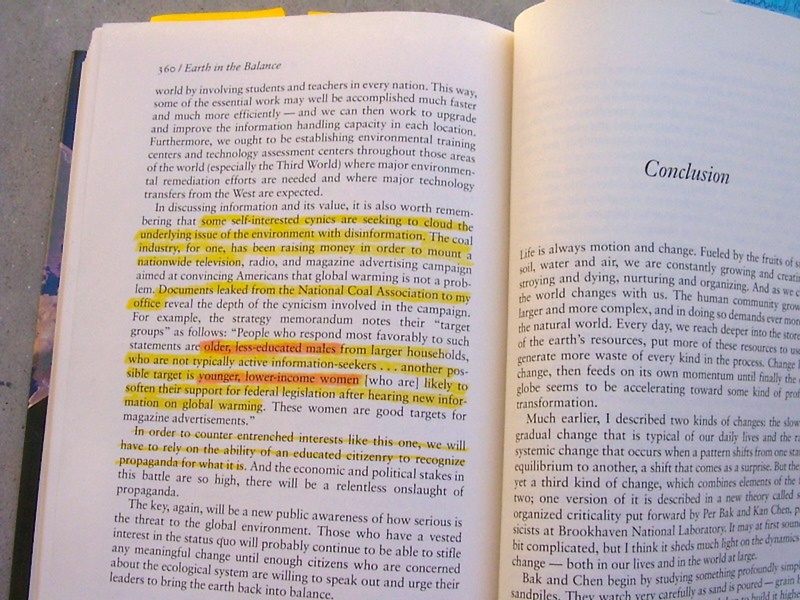 Note how Gore’s 1992 book pre-dates Gelbspan’s 1995 radio interview quote of those same words… yet Gore later prominently said Gelbspan discovered that memo set. 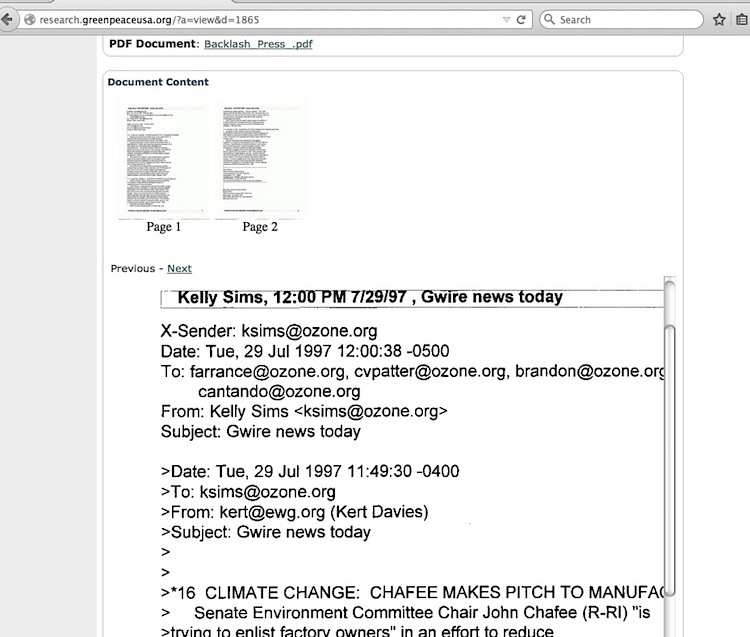 I can at least say Kert Davies had ties with Ozone Action as far back as 1997, since Greenpeace saved a copy (screencapture here) of his July 29, 1997 email from his Environmental Working Group address to a person at Ozone Action. 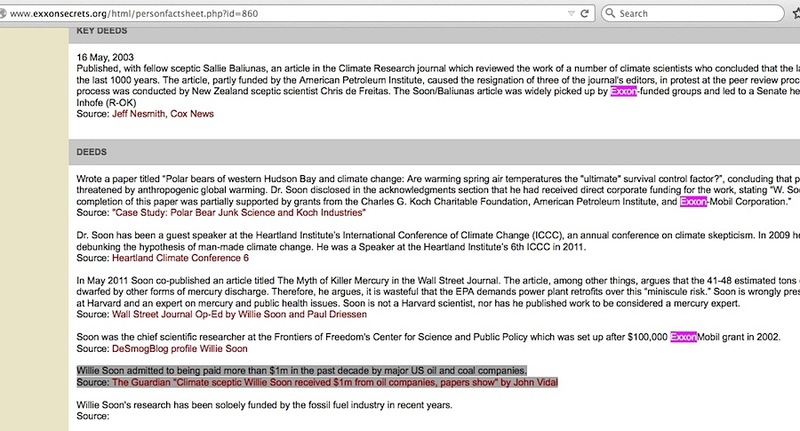 What is the critical missing element to this 20-year collection of ‘breaking news stories’ about skeptic scientists’ funding? 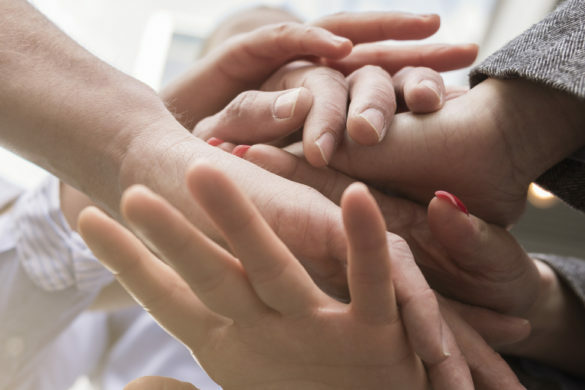 Any scrap of evidence proving the skeptics falsified/fabricated data or conclusions as performance required under a monetary grant or paid employee contract. It’s all guilt-by-association and nothing more. Commit political suicide, we much?